(Editors note: It is NOT RECOMMENDED you read this blog if you are queasy in general, and eating in specific. We are serious. You were warned). Hi there! 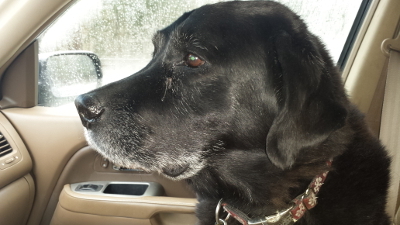 It's handsome Coal Dog and it's my turn at the blog. I hope I don't let you all down! We moved back to the Southport cabin and I threw up my first four meals. I threw them up because I ate a bunch of rotten wood on our morning walks. Don always yells at me to stop, but what dog can resist? It's succulent rotten wood we're talking about here! I can't get enough. Rotten wood is everywhere and I throw it up a lot. Don usually cleans my throw-up without too much trouble or anger. And sometimes I'll get the pat on the back and he'll say "You OK, Coal?" Then he'll slip me a little treat without the other dogs knowing because he knows all the food I ate is now on the floor. So I feel bad that I set off the whole "17 Messes in May." Don had to clean up 17 of our messes in 24 hours of May 7th and 8th. Those 24 hours almost broke Don as we know him. Here's how it happened. Saturday, May 7th 10am - Don is very proud that The Cabin has power, water and internet. Linens are changed. The fridge/freezer is stuffed with beer, water jugs and food. I throw up a bunch of wood and partially-digested kibble (#1) on the rug near the sliding glass door despite the sliding glass door being wide open. Don yells at all the other dogs trying to eat the partially-digested kibble around the wood chips. He scoops up the mess with a pizza box and sprays the entire area with a bunch of Nature's Miracle. Saturday, May 7th, 12:00 noon - You have to hand it to Don. The Cabin is looking good! The tarp is off the chimney, the picnic table is back on the deck, and dog food and water bowls are washed and out. Max drinks a bazillion gallons of water and throws up (#2) about 2ft from my earlier throw-up. Don responds by angrily throwing all dogs out of the cabin along with the water bowl. Saturday, May 7th, 12:01 - Buddy sneaks back inside through the other door and eats Max's soupy vomit while Don isn't looking. Then Buddy throws up (#3) on the rug about 6-inches from the original mess. Don scoops most of the mess up and soaks the entire carpet with Nature's Miracle. Don's swearing is now constant and very colorful. Saturday, May 7th, 12:30 - Don brings everydog down to Horn Cove Beach for a work break. Big Buddy Dog goes absolutely berserk down at the beach. He eats just about anything - rotten seaweed, washed up dead fish, sand, bits of waterlogged wood, mussel shells, snails, nails, jellyfish, old plastic bottles filled with tobacco dip spit..... And worse. And what's more, Buddy'll wash it down with a bunch of seawater. Drinking seawater means badness, Buddy! No matter how good it tastes! And before you go feeling bad for Don, you should know that he let Max and Auggie eat kelp without restraint. Max and Auggie really like eating kelp. Don usually lets them eat a few kelp stalks, but won't ever let them eat the kelp leaves because, guess what? The kelp leaves make them sick in both the pukey and poopy way. Max and Auggie ate lots of kelp leaves at Horn Cove that day. Saturday, May 7th, 2pm - Don loads everyone in the car to go to Porter's Preserve for Walkies. Max throws up en-route in the way-back of the Honda Pilot (#4). Don doesn't realize this until he lets the dogs out. Vomit is all over the dogs and everything else. The noise Don makes is savage at first but becomes a desperate, pleading whimper. Don scrapes vomit out of the car with a hardware store flyer and we head to the beach. I win round after round of Swimmin' Kick Fetch. Max and Auggie gorge themselves on kelp leaves again, and Buddy grazes over a complete buffet of rotting flotsam and/or jetsam. A good time is had by all. Saturday, May 7th, 4pm-7pm - Don is peacefully at his computer with the Red Sox game on the radio when Max (#5), Auggie (#6), and Buddy (#7) all vomit or have diarrhea within a short time. Buddy also has diarrhea (#8) in the guest bedroom that Don doesn't find until after he's cleaned up the other vomits. The "Telltale Vein" in Don's neck is very pronounced and throbs alarmingly. Don runs out of Nature's Miracle. Saturday, May 7th/May 8th, Overnight - Buddy continues to have diarrhea in the kitchen and the back room (#9, #10, #11). I throw up my nightly wood chips onto the green shag carpeting (#12). Don hears Auggie throwing up in the bed (#13) and bolts up to throw Auggie out the front door. On Don's way back to clean up Auggies bed mess, he discovers my wood chip vomit by stepping in it. I expect Don to explode but his shoulders visibly sag. He opens the windows and sliding glass doors to "air the damn place out." Don cleans up the worst of the messes with paper towels, puts old magazines over the worst spots, and lets Auggie back inside. He leaves the sliding glass door open so we can get out to vomit and poop. He goes back to bed with the doors and windows open despite it being very cold with an East wind off the water. So very cold for a person who has to sleep under blankets like Don. Sunday, May 8th, 6am - Don wakes up and feeds us. He then starts cleaning up the "standing messes" from last night. I think he's a little disappointed that there's so many messes in the cabin despite leaving the door open. But don't feel too bad for Don. Did you know Dogs can smell better than Don by 300,000 times? He opens the back door and all us 4 Good Boys run out of the very stinky cabin. After eating, Auggie and I throw up on the deck (#14) (#15). And Buddy has diarrhea on the path to the car (#15). Don comes up with several new and colorful swears but you can tell he's running out of fight. He hoses off the path, loads us all in the car and we head for the shop and Walkies. Sunday, May 8th, 9am - When we get to the shop, Don goes inside to get more Nature's Miracle and Buddy has a little diarrhea accident (#16) in the way back of the car. I think it's little anyway. To Don it might as well have been an Atom Bomb. I have never seen Don so disturbed. He yells and swears and there's spittle coming from his mouth and he throws the Nature's Miracle bottle into the alley out back and he slams the car door. Then he stomps off to get the hose. He cleans up most of the mess by hand, hooks up the hose and blasts the way-back of the car with the hose. He laughs maniacally and argues with himself in low, angry tones. Sunday, May 8th, 10:00am - Don loads all us dogs back in the car. He is unusually calm. When we're all loaded up, we head out and Buddy has VERY big diarrhea (#17) on the floor of the back seat. Silently and without stopping, Don lowers all the windows, opens the sunroof and sticks his head out the window like a dog. He pulls into the Boothbay Harbor self-serve car wash and opens the car doors. All dogs flee the car, but Don is completely silent. Max and Auggie run over to the Irving and beg for food at the front door. Buddy meanders around the car wash parking lot eating things off the pavement. I sit dutifully outside the car wash hoping there wasn't too much diarrheah on my Kick Fetch. Don doesn't notice any of us, and when he's finished, he gets us all in the car and takes us back to The Cabin. For the first day in years us 4 Good Dogs don't get Walkies. Instead of taking us on Walkies, Don drives back to The Cabin. He locks us out and lays down on the couch. He silently stares at the ceiling for a long time. Sunday, May 8th, 6:00pm() - When Liana comes home, Don goes into the guest bedroom and closes the door. Liana gets the 4 Good Dogs our dinner and goes back to check on Don. He speaks in hushed, measured tones using few words. After a while, Liana comes out of the guest bedroom and she gives us some treats. She works for a little bit on her computer and goes to bed. With Don in the guest bedroom, we have marvelous snuggies in the big bed - it's big enough for everyone! I am Coal and I love you. I will always love you. Max and Aug's Dog Blog is a weird little grouping of writings that come from one of four Black Labs - Max, Auggie, Buddy, and Coal. Most blogs are about how they drive their owner "Don" absolutely nuts. "Don" himself has been known to write a blog now and then. The Labs have different personalities and skills for driving "Don" crazy - The Cold, Calculating Auggie, The Friendly and Smart Max, Big Dumb Buddy, and the Ever-Faithful Coal. So grab a cup of cocoa or fortified wine and prepare to have your brain tickled or angered. Either way, you win!